WHOA! Color! I know! It's crazy! I've been trying out a different drawing/inking/coloring style with some stuff that I've posted on Facebook and I wanted to try it on a full comic. I think it turned out pretty well, but it really took a long time. I'm not sure if I'll be able to do this every week, but it was fun to do! 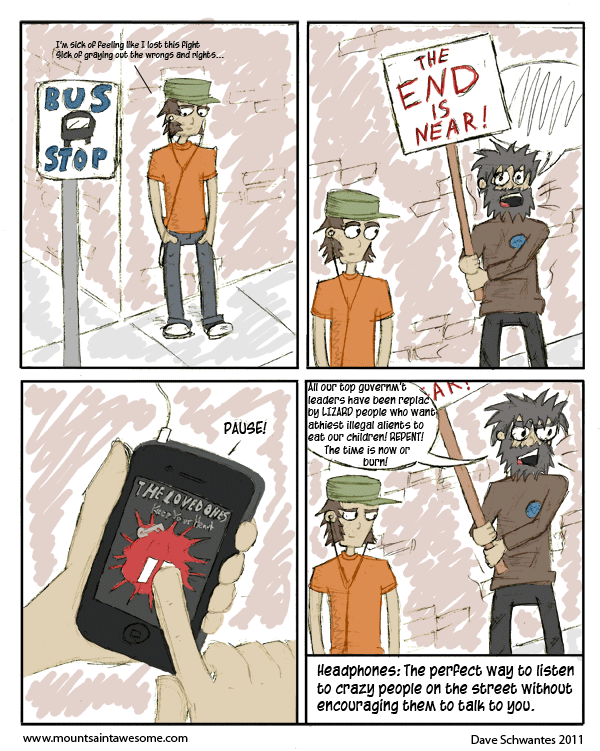 So, this comic is based on something I used to do all the time waiting for the train/bus in Chicago. Now that I'm in Berkeley there are a lot more crazy people, but I'm waiting for public transportation much less, so I don't get the time to really soak in most of the crazy rants. Also, I was pretty pleased with how the "Keep Your Heart" cover art in the 3rd panel turned. Finally, this week I stumbled across a few smaller comics that I really enjoyed (enough to read the whole archives) and they both happen to be kind of music related. It's like we're kindred comic spirits! The first is 3 Chord Dorks, which is about a guy who really likes AC/DC and the other is called Maybe Too Metal which I don't think is to metal at all!